Barberries belong in the genus Berberis, and they have been prized as garden plants for centuries. There are over 450 species from all over the world, and the barberry family (Berberidaceae) includes a wide variety of shrubs and perennials. Barberries can be evergreen or deciduous, and some are temperate and some are sub-tropical. All grow from 3-15 ft. in size and produce small clusters of yellow or gold flowers followed by small berries. These berries can be very showy, and they are also great for attracting birds. The berries are edible and high in Vitamin C, but they are extremely tart and can cause illness and stomach distress if consumed in too great a quantity. They are used in small amounts in a number of traditional Persian dishes. Autumn colour on the deciduous species is usually long lasting and spectacular. Barberries are extremely spiny, and they make excellent hedges and habitat for nesting birds. The words “barrier” and “barb” are both derived from the same original Greek words for these shrubs. They are extremely easy to grow, requiring only full sun and well drained soil. Once established, most of them are quite drought resistant. Some are very fast growing and some grow extremely slowly, and there are several dozen hybrids and cultivars now available. It is only in recent years that Canadians have been allowed to grow barberries in their gardens. A few species (not all) function as alternate hosts for wheat stem rust; a devastating fungal disease that can literally wipe out crops of wheat, barley, oats, and rye. In the 1960’s, the sale and importation of ALL species of barberry became prohibited in Canada. That law was changed in 2002, and a few species that are safe to grow have become extremely popular in landscaping in a relatively short period of time. All plants in the barberry family contain the alkaloid berberine, which can cause cramping, vomiting, increased heart rate, lethargy, and low blood pressure if consumed in a very significant quantity. (*The possibility of this happening though, is very remote.) Many species have been used medicinally, and barberry stems, roots, and bark have historically been used to make a brilliant yellow dye. Himalayan Barberry (Berberis aristata)– A gorgeous evergreen species growing up to 10 ft. tall with handsome, glossy green leaves and very showy golden flowers that are followed by shiny, egg-shaped red berries. These berries are extensively used in traditional Indian medicine. It can handle colder temperatures than one would expect and it is often cultivated in regions where it is hardy. Darwin’s Barberry (Berberis darwinii)– Discovered by Charles Darwin in South America in the 1830’s, this is an absolutely stunning species that can grow as tall as 10 ft. but is usually quite a bit smaller. The leaves are small, very dark green, and heavily spined. This has made it popular for hedging and use as a barrier plant. The flowers appear in great profusion in early spring and are usually bright orange but can also be golden yellow. They are extremely showy and are followed by edible but highly acidic, showy blue-black fruits. Although it has received the RHS award of merit, this species has naturalized in Australia, New Zealand, some parts of the USA, and Ireland and in some places is considered a weed. Korean Barberry (Berberis koreana)– I am baffled as to why this compact, lovely shrub is not more commonly available to prairie gardeners. Growing about 5 ft. tall, it has handsome green leaves that colour up splendidly in the fall. The showy gold flowers are followed by glossy red berries that provide a great deal of winter interest and feed many birds. Indeed native to Korea, it is perfectly hardy and well behaved in the garden. Japanese Barberry (Berberis thunbergii)– Native to Japan and other cold places in eastern Asia, this is by far the most popular species for growing in cold climates. If you have a barberry cultivar in your garden, it is most likely derived from this species. In the wild, it is highly variable growing from 3-9 ft. tall and wide with extremely spiny, usually arching branches and excellent fall colour. The flowers are pretty but quite small and not usually very showy. These are followed by red berries that are so tiny they are usually unnoticed. The high degree of variability is what has led to such a great number of cultivars being available. A naturally occurring purple leafed variation (var. ‘Atropurpurea’) can grow up to 8 ft. tall and has given rise to a great many forms that have been of use to plant breeders. The leaves are usually dark green becoming bright red in the fall, but most of the garden cultivars have been selected for foliage of a different colour. Some forms grow quickly and others do not. They often do not deal well with chinook zones and will suffer considerable dieback in the first few years of their life. They become hardier and more reliable with time. While they are happiest in a moist, somewhat fertile soil they are very drought resistant once they are well established. They generally do not suffer from pest or disease issues, and they do not sucker or self seed. Deer and rabbits are known to eat young plants, but usually leave established specimens alone. There are several dozen cultivars available and not all of them are prairie hardy. I have chosen to focus on those that can be reliably expected to survive an Alberta winter. ‘Cherry Bomb’– A slow growing, very compact form with heavily pink and cream variegated new growth that ages to a dull purple. The small yellow flowers show up nicely against this dark background. 3 x 3. ‘Concorde’- A very dwarf, compact form with pinkish new growth that ages to dark purple. Slow growing. 2 x 3. ‘Crimson Pygmy’– Very similar to ‘Concorde’ but the foliage is more of a red-purple and it’s not especially hardy. Prone to dieback and tipkill. ‘Emerald Carousel’– A nice large barberry with elegant, arching branches and a profusion of bright yellow flowers in the spring. The leaves are bright green and become an outstanding brilliant red or reddish purple in the fall. The tiny red fruits are most noticeable in the winter months. 5 x 5. ‘Golden Nugget’- The smallest cultivar, and ideal for small beds and rock gardens. Very dense and slow growing with tiny, bright golden green leaves that are a coppery orange upon first emerging. 12” x 18”. ‘Rose Glow’– Undoubtedly the most popular of all, this is a lovely medium sized shrub that produces white and pink mottled new growth that ages to dusky purple. Fall colour is an intense burgundy with a strong rose tint. Branches are gently arching, spines are quite long. Reasonably fast growing. 4 x 3. ‘Royal Burgundy’– Very tiny leaves are a brilliant deep purple. Fall colour is vivid scarlet. 2 x 3. ‘Royal Cloak’– Similar to ‘Royal Burgundy’ but with larger leaves and faster growing. New growth is noticeably pinkish. Fall colour is a dull red. 3 x 3. ‘Ruby Carousel’– Reddish purple foliage, exceptionally spiny branches. Don’t back into this one! 4 x 3. ‘Sunsation’– Glowing golden foliage with a strong copper tint. Slow growing and prone to dieback. Foliage becomes a beautiful glowing orange in fall. 3 x 3. Common Barberry (Berberis vulgaris)– Native to many countries in Europe, the middle east, and northern Africa, this species grows up to 6 ft. tall and wide and has very spiny branches, green leaves, yellow flowers, and very showy red fruits. It was once widely planted but as it hosts the wheat stem rust, it has been largely removed from circulation in the nursery trade. There are established populations of it that have naturalized in both the Edmonton and Calgary areas. Berberis x lologensis ‘Apricot Queen’– A stunning hybrid barberry with evergreen, very small spiny foliage and gorgeous soft orange flowers for most of May. These are followed by edible blue-purple berries. Officially hardy only to zone 5 but has been known to be able withstand temperatures as cold as -24 Celsius for brief periods. Has received the RHS award of merit. Berberis x stenophylla ‘Corallina’– A tiny, hybrid barberry that I would like to try growing in a container. This is a deciduous form with spiny, dark green leaves and bright coral coloured buds that open to showy yellow flowers. These are followed by attractive blue fruits. It grows slowly and only reaches 6-12” tall and wide. Blue Cohosh (Caulophyllum)– There are only two species in this genus; Caulophyllum thalictroides which comes from moist, rich woodlands in eastern North America, and Caulophyllum robustum, which comes from similar habitat in Japan. Both are very much alike. Blue cohosh was greatly prized by indigenous peoples as a medicinal plant, and it was extensively used to treat menstrual issues, childbirth, and occasionally to kill parasites. It is a beautiful woodland plant that likes a sheltered site with moist, deep rich soil. Very attractive compound leaves emerge in the spring and have a lovely blue-green cast to them. A single flower stem soon also appears, and the blooms range from greenish yellow to nearly purple. They are not showy but give way to stunning blue berries. Although it makes a gorgeous companion for hostas, ferns, and primulas, it is rarely cultivated. This is likely due to the fact that the seeds are difficult to germinate and the rhizomes do not like to be disturbed. It grows slowly but can easily live for 50 or 60 years. If you are able to acquire it, it is a perennial worth having. Bishop’s Hat, Barrenwort (Epimedium spp. )– There are currently 64 species in this genus, all from cold places in Asia. New species are being discovered with some regularity so expect this number to go up considerably in the next few years. Some species are evergreen, some are herbaceous, and some are a curious blend between the two. The name bishop’s hat is a reference to the shape of the flowers; some of them resemble a clergyman’s hat. Barrenwort refers to their historical medicinal use; it was once believed they could prevent a woman from conceiving. Before we discuss these wonderful plants, the fact that they are available in the nursery trade at all is largely due to the work of an American man named Harold Epstein (1903-1997). Harold began gardening in the 1930’s shortly after he got married. An accountant by training, gardening started as a hobby and led to a friendship and involvement with the Brooklyn Botanic Garden in his home state of New York. Harold was an enthusiastic and brilliant plantsman with a strong eye for detail and what would work for the nursery industry. It wasn’t long before he began making trips to Asia to seek unusual plants, and while Japan was his favourite destination (he made 29 trips there between 1963 and 1983) he also botanized in China, Taiwan, and Korea. He was responsible for the Japanese forest grass (Hakonechloa) being introduced to the nursery trade in North America, and he has also had a magnolia named after him. Epimediums became his passion, and before he came along, these plants were virtually unknown in North America. He single handedly made the perennial world notice these plants, and was instrumental in getting them into the hands of North American gardeners. He was for many years the world’s leading expert on these plants, and upon his death at age 94, many who knew him were astounded to learn he was entirely self taught and had never formally studied horticulture at any point in his life. Harold has been honoured with having two of these plants named for him; Epimedium epsteinii, a gorgeous Chinese species with the most incredible white and purple bicoloured flowers, and Epimedium koreana ‘Harold Epstein’, which is an extremely hardy and vigorous grower, with enormous (for an epimedium) flowers of soft yellow. These are clumping, beautiful perennials that are grown for both their foliage and their flowers. The leaves are often heart or shield-shaped and frequently become splendid shades of red, orange, or yellow in the fall as well as being quite beautiful upon emerging in the spring. The dangling, ethereal little flowers are very pretty but not always showy. They may be white, red, orange, yellow, rose, violet, purple or pink. They bloom early and slowly form sizeable clumps. They can handle everything from partial to considerable shade and while they like moisture, they are also reasonably drought tolerant once established. More and more of them are being introduced to the nursery trade every year. Zone ratings are often listed as 4 or 5, but many of them are much tougher than people realize and they should be widely experimented with. Some are perfectly hardy and some are not, but I recommend trying as many as you can and see how they do for you. Epimedium fargesii- This is a rare Chinese species slowly starting to work its way into the nursery trade. It has evergreen foliage, very thin and unusual pale violet flowers, and peculiar bronze coloring in the fall. It is also much hardier than one would expect. ‘Alabaster’– Very large, semi-double glowing white flowers. Absolutely shines in a partly shady spot. ‘Bandit’-Green leaves have a very unusual dark purple edging and are complemented by a profusion of ivory coloured flowers. The fall colour is absolutely outstanding. ‘Dark Beauty’-Foliage emerges a wonderful chocolate-purple and slowly ages to green. Large bicoloured blooms of white and purple. Quite fabulous. ‘Lilafee’ (‘Lilac Fairy’)- Large, light purple to mauve flowers in great profusion and large leaves. Vigorous grower and hardy. ‘Red Queen’– Hot pink flowers and vivid scarlet fall colour. ‘Red Beauty’ is very similar but flowers earlier. ‘Sirius’-Large white blooms with a faint blush of pink. Blooms for weeks. Epimedium koreanum ‘Harold Epstein’– With very large leaves and the largest flowers I have seen on an epimedium (butter yellow in color) this is a vigorous grower although late to break dormancy in the spring. It has done well in zones 2 and 3 but is often sold as being much more tender. It will spread slowly where it is happy. Epimedium x rubrum– Very popular and compact, and growing only 12-14” tall and wide. The flowers are pinkish red and the fall color is very bright and showy. Reliable and great for beginners. ‘Sweetheart’ is a more vigorous selection of this hybrid with leaves heavily infused with red on emerging. Flowers are bright pink. Epimedium x versicolor ‘Sulphureum’– Lovely soft yellow flowers on a reliable plant that is hardy and clumps up very quickly. The fall colour is a wonderful burnished bronze or gold. Epimedium x warleyense ‘Orange Queen’- The pinkish red or orangey-pink flowers are pretty enough but it is the outstanding bright orange fall colour that makes it such a desirable plant for the shade garden. Epimedium youngianum x ‘Niveum’– I think this species wants to be evergreen; it came through three winters for me before giving up the ghost. The leaves are a handsome copper color in the fall and the pure white flowers are like little stars. I would try it again. ‘Roseum’ is similar but with rosy-lilac flowers. Jeffersonia– Named for American president Thomas Jefferson, there are a few species here but none are common in North American gardens. If encountered, Jeffersonia diphylla is usually what’s on offer. Native to rich, moist, and often limy soils in the deciduous woods of eastern North America, this is a hardy perennial to be cherished and admired. Reaching about 12” tall, this lovely plant grows from slowly creeping rhizomes and blooms only very briefly in the spring. The flowers are white and beautiful, followed by fascinating seedpods if pollination occurs. The seeds secrete an oil that is highly attractive to ants, which aid in the dispersal of the seeds. The fascinating leaves are divided almost in half, giving rise to the common name of twinleaf. It is a very handsome and perfectly hardy plant, though not often available in the nursery trade. It establishes slowly and is difficult to grow from seed. It is a protected species in at least four of the states where it occurs. It has a long history of medicinal use by indigenous peoples and makes a marvelous jewel for a woodland garden. Jeffersonia dubia is a Korean species from moist, partly shaded areas usually on the edges of deciduous woods. The flowers are large for the size of the plant and appear in early spring, usually being blue-mauve or violet in colour but occasionally lavender or soft pink. These plants appreciate compost and good soil and are not suited to dry conditions. Mahonia– There are about 70 species in this genus, and they are native to Asia, Europe, and North America. They have spiny, evergreen leaves and showy yellow flowers followed by clusters of grape-like fruits. Many are winter bloomers and many are prized as landscape shrubs. By far the best known species is the Oregon grape (Mahonia aquifolium). This is a common evergreen shrub of the west coast, also called grape holly or holly grape. It is the state flower of Oregon and sometimes grown in gardens. It usually grows about 3 ft. tall and up to 5 ft. wide. It suckers and forms small thickets, and it is sometimes gathered and used as greens by the cutflower industry. The foliage is evergreen, spiky, and definitely bears a resemblance to holly. The flowers are brilliant yellow and give way to very grape-like, bright blue fruit. These fruits are edible (if somewhat bitter) and are great for attracting birds to the garden. ‘Apollo’ is a very compact and heavy blooming cultivar of this species. Creeping Oregon grape (Mahonia repens) can be found throughout western North America and throughout the Rockies, including Idaho, Montana, and southwestern Alberta. There is also a well known inland population of it from the Black Hills of the Dakotas. It usually behaves as a ground hugging shrub just a few inches tall but occasionally grows larger. It will grow in sun to considerable shade, and can handle poor soil, drought, competition, and wind. It also has no pest or disease issues. Even browsing deer prefer to leave it alone. The flowers are very showy but do not last very long; the same is true of the bright blue fruits. Occasionally it develops quite beautiful bronzy purple fall color but this is inconsistent. It can be rooted from cuttings or by layering, and if you are patient, it can also be grown from seed without too much trouble. Look for it on dry, sunny slopes and the edges of woods. It can be slow to establish in a garden but never the less makes a splendid groundcover if given enough time. While there are dozens of species of Mahonia that are grown in places that have mild winters, by far the best known species is Mahonia lomariifolia. It is native to southwestern China and has reddish bronze leaves when young that age to a shining green. The leaves are up to 20” long and have up to 40 spiny leaflets. The flowers are bright yellow, fragrant, and held in large clusters. They can appear anytime from autumn through spring and it is cherished as one of the showiest and easiest of winter flowering shrubs. It likes moist soil rich in organic matter and will do best if protected from the hot afternoon sun during the summer months. Quite a number of hybrid cultivars have been developed, including the gorgeous ‘Charity’ and ‘Winter Sun’. These are often listed as Mahonia x media. Mahonia is so closely related to Berberis that under the right conditions, they can actually hybridize with each other. The resulting offspring, commonly listed as x Mahoberberis, share traits of each parent, including evergreen foliage, yellow flowers, and occasionally dark coloured fruits. They are sterile but sometimes grown as garden shrubs. The close relationship between these two groups of shrubs had led botanists in recent times to study the DNA of both groups, and there are many who want to merge these two genera. Many species formerly listed as Mahonia are now being called Berberis in the textbooks, much to the general annoyance of most gardeners, including myself. Vancouveria– Named for Captain George Vancouver, this is a small genus of three evergreen species native to western North America. They are sometimes called inside-out flowers and are similar in many ways to Epimedium but they are definitely not as hardy. The great British gardener Christopher Lloyd declared them inferior to their Asian relatives and not worth bothering with. Many gardeners disagree with this assessment and are quite fond of them. V. hexandra is the best known species, and forms a small, slowly spreading clump of attractive green leaves. The flowers are white and not showy. Growing 8-10” tall, this species can handle some dryness once established but definitely performs best in moist, acidic soil. It is occasionally grown as a groundcover in parks and gardens. A Brief History of Pumpkins (and all their autumn glory. Pumpkin flavored ice cream. Pumpkin flavored coffee drinks. Pumpkin cakes and pies. Plastic pumpkins. Fresh pumpkins. Large pumpkins. Tiny pumpkins. How did pumpkins become synonymous with autumn? Let’s take a look at the history of pumpkins and at some interesting pumpkin trivia. Read more at Dave’s Garden. Research suggests plants might be capable of more than we suspect. Some scientists – controversially – describe plants as “intelligent”. They argue a better understanding of their capabilities could help us solve some of the world’s thorniest problems. Four experts talk to the BBC World Service Inquiry programme about what plants can teach us. Read on. Some of this was being passed around among gardeners here. Luckily someone realized what it was, and think we have all managed to kill it. Two aspects of this may be of interest: First, and I never realized this, the flower is native to Bhutan. And, second, it is the flower. Remember a few years ago, it was all the rage to try to grow these. I never did attempt it, but I lots of gardeners did. The first Joe-pye weed I saw was on the property where my grandparents homesteaded close to Drayton Valley. My mother owned this property and had a small cabin erected and planted gorgeous flowerbeds on a couple of acres around the cabin. The Joe-pye weed (Eupatorium purpureum) grew into a bold and lush clump at the back of one of the beds, blooming profusely for years – in fact it’s still there! I have had a clump in my own garden for about 7 years now too and love the height and generous pink plumes that it produces late in the season. It has some lovely properties: I’ve never had to stake it, the bees and butterflies adore it, and the flowers last a very long time when cut. It spreads slowly in my garden – after 7 years it is a clump about 2 feet in diameter at the base but is easily 6 feet tall in the fall. the countryside, it was never watered except by Mother Nature. If you have the space, this is a lovely late summer attraction for your garden. Originally beans all had a fibrous spine running the length of the pod. These strings had to be stripped before the pod was eaten. In 1894 a plant breeder named Calvin Keeney developed the first string less bean. Some writers suggest the old string bean varieties have better flavour. The bush varieties are early—50 to 60 days—and produce all their fruit over a short period of time. Pole bean varieties usually require 60 to 80 days to produce pods. The bean commonly called runner bean, Scarlet Runner being the best known, is a different species whose scientific name is Phaseolus coccineus. This bean is a perennial vine (annual in our climate) with an edible tuberous root. Most varieties have red flowers and multi-coloured seeds. The pods may be eaten when they are young and tender, and the seeds may be eaten either fresh or dried. There are not many cultivars of runner beans, but in addition to Scarlet Runner, Polestar is sometimes available. The Chinese long bean is a sub-tropical annual climbing vine named Vigna unguiclata, completely unrelated to the other beans. They begin setting pods 60 days after planting; the pods grow rapidly, and they continue to set fruit until frost. Black Knot, caused by the fungus Apiosporina morbosa, is a common disease of plants in the genus Prunus. A survey in Alberta revealed a significant and widespread distribution of Black Knot found in commercial, municipal, private and natural plantings. Infections spread rapidly, reducing the aesthetic value of affected specimens; high levels may result in the eventual death of the plant. More from Alberta Agriculture. 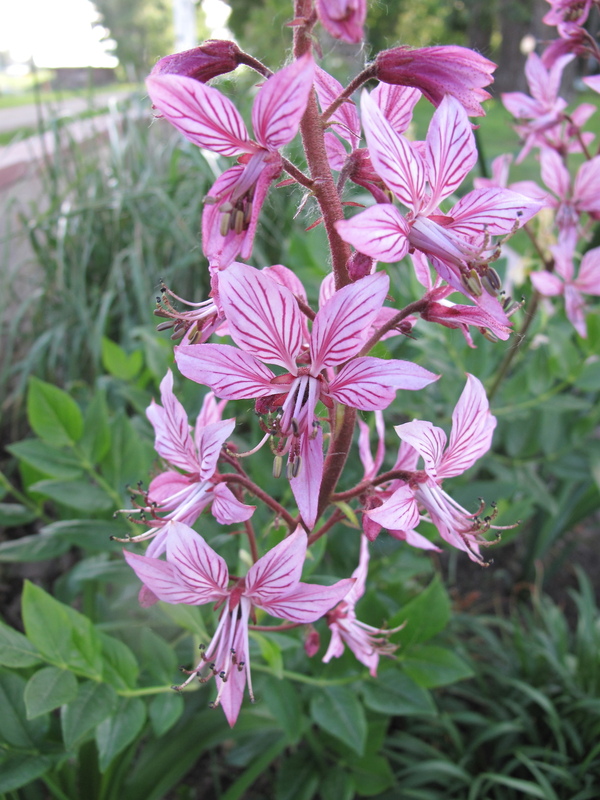 Also known as gas plant and as dittany, Dictamnus albus is a very good choice for southern Alberta flower gardens as it happily tolerates our high pH soil and fairly dry conditions once it is established. Nor is it bothered by pests or disease. Like the peony, it takes a year or two to get established, and is also very long lived. It will not transplant or divide because it has a long central root. It needs sun to part shade. The gas plant reaches a mature height up to one metre tall, but does not require staking. Its shiny, waxy bright green foliage has a strong citrus fragrance, and its flowers, either pink or white depending upon variety, bloom on a 20-30 cm long spikes during June. The seed pods, nearly as striking as the flowers with their unique shape similar to star anise, remain on the plant into early winter. If left to shed their seeds they will self-sow a few plants, but even the tiny seedlings are hard to transplant. A volatile oil given off by the plant is the reason for its common name, gas plant. On a still hot day, and even into the night, this gas can be briefly lit. A flame placed at the base of the flower stem will produce a burst of flame that ascends the stem but does not burn the flowers. These videos of the plant being lit, in daylight and at night, demonstrate this feature. “This rash, known as phytophotodermatitis was caused by a reaction of this (phyto) plant’s toxic chemicals -furocoumarins – with UV rays (photo) from the sun causing rash-like burns (dermatitis). Furanocoumarins are toxic chemicals that some plants produce to protect or defend themselves from insects and mammals. These toxins do not affect everyone, but if the concentration of the chemicals is high enough, and the conditions are right (hot sun – mid to late summer and moisture on the skin from swimming or perspiration) they can cause some extremely uncomfortable symptoms. This is a stunning and vigorous addition to a garden, but be careful touching it until you have determined if you are sensitive to it. And probably children should stay away from it. The whole plant is thickly covered with silky hairs. A First Nations legend tells that the Great Spirit gave the crocus its fur coat to keep it warm during cold spring nights. And those fine hairs work. They prevent the wind from hitting the surface of the plant, and the temperature at the surface of the leaves can be 10 F. degrees warmer than the surrounding air. As further protection, the flowering stalk is short, only 15-20 cm long. sun through the day. Pollinators are encouraged to visit these early blossoms. like the grey heads of old men. These fluffy seed-heads, nearly as pretty as the flowers, linger into early summer. As the seeds develop the stalks grow taller, reaching 30-45 cm in height, so seeds can be wind dispersed across the grasslands. sunny spot, and don’t water very much. Do not be tempted to take these from the wild. It is illegal and immoral to dig wild plants, and because of their taproot, they will not transplant. Garden centres often stock the closely related European plant Pulsatilla vulgaris. It has a number of cultivars of different colours including white, red, light pink, and dark purple-blue. There is also a cultivar named ‘Papageno’ that is semi-double with frilled edges. I have read there is a light lemon yellow variety of the prairie crocus called P. patens var. flavescens. If you ever see this plant, buy one for me. Winter Backyard Bird Visitors – From the Nature Conservancy of Canada, including a guide you can download. From Dave’s Garden website, Todd Boland says, “Ferns have become an indispensable addition to the modern garden” and a whole lot more. The genus Campanula, commonly known as bellflowers, comprised nearly 300 species. Many of these are well-known perennials for the border. This article will introduce you to the most common border bellflowers.